2014’s Top 10 States have shown tremendous leadership in the green building movement by certifying 1,662 commercial and institutional projects representing 251.7 million square feet of real estate. These buildings will have a tremendous social impact over the coming years by providing healthy and environmentally sustainable spaces to produce new breakthroughs in the many different fields of science, medicine, education, business, the fine arts and environmental/social justice. This recurring weekly series will feature one project per week in each of 2014’s Top 10 States for LEED. The goal of this series is to help share the powerful stories of how LEED buildings are positively impacting people’s lives through providing healthier, more environmentally sustainable spaces for people to live, learn, work, play and worship. Each state, beginning with Illinois, 2014’s first overall state for LEED green building, will have a different highly impactful project profiled that touches on one of these core areas and demonstrates how business, universities, faith communities and non-profit organizations across the country are using LEED. The Advanced Protein Characterization Lab at Argonne National Laboratory in Argonne, Ill.
As the top state in the nation for LEED for the second consecutive year (3.31 square-feet of LEED certified space per resident), Illinois boasts an impressive amount of innovative, newly certified projects. 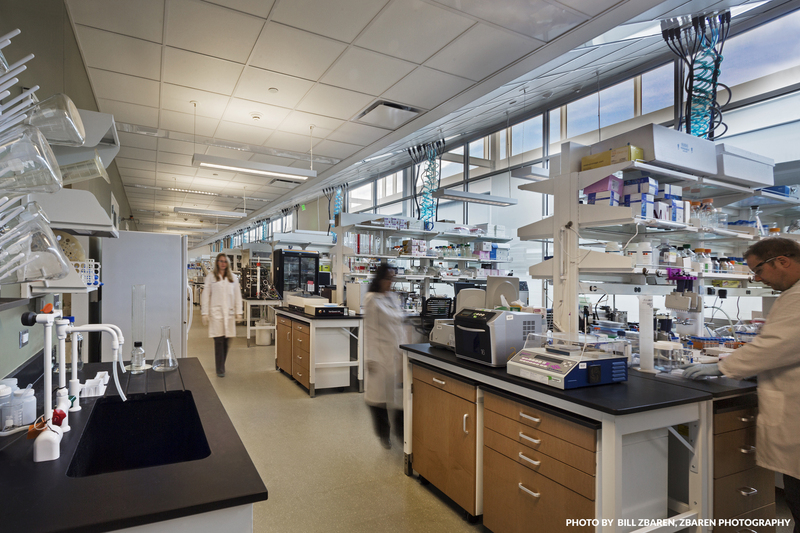 And, talk about cool projects, this state-of-the-art, 55,486 square foot lab adds to Illinois’s collection of world-class research facilities. The Advanced Protein Characterization lab has many innovative sustainability features including high performance glass with an electrochromic shading feature, an advanced stormwater management system and innovative energy saving features in its laboratory and mechanical spaces such as enthalpy energy recovery. And, in case anyone reading this happens to be wondering what exactly goes on in an ‘Advanced Protein Characterization lab,’ Dr. Andrzej Joachimiak, director of the Structural Biology Center at Argonne National Laboratory was able to break down the facility’s research into laymen’s terms. “Discoveries arising from this facility will form important contributions to the understanding of systems and structural biology in the fight against infectious diseases,” said Joachimiak. “This state-of-the-art facility will provide researchers with the advanced technology and expertise for protein science experiments in Illinois and nation-wide." Linked to the Advanced Photon Source, the Advanced Protein Characterization Facility (APCF) will efficiently deliver “crystals to X-ray beams” as part of the Argonne National Laboratory's ongoing research into three-dimensional structures of proteins, other biological macromolecules and characterize their functions. The Midwest Center for Structural Genomics (MCSG) has developed an additional, high-throughput pipeline that produces more protein structures than almost any other organization on earth. The new APCF will establish a state-of-the-art, highly automated laboratory and scientific collaboration facility to produce the proteins and protein crystals needed to take full advantage of Argonne National Laboratory's capacity for determining the three-dimensional structures of proteins and other macromolecules. In addition to the MCSG, the APCF will also host researchers from the Center of Structural Genomics of Infectious Diseases with a program focus on determining structures of potential protein drug targets and their complexes with inhibitors from human pathogens. The APCF will provide high-quality structural models for a significant fraction of biomedically and biologically important proteins and protein families. The goal is to develop a foundation for 21st century structural biology where the high-quality structural models of virtually any protein or protein complex will be available through the Protein Data Bank or computer modeling. In addition to the Advanced Characterization Lab, projects like the AON Center and NBC Tower (both in Chicago) also helped Illinois reclaim its top spot in the nation for 2014. Illinois is the first state to place first in the nation over the course of consecutive years since USGBC began announcing its Top 10 States for LEED in 2010. View photos of some of the most notable projects to certify in the Top 10 States in the slideshow below.